Students won’t be able to get inside of the new structure rising adjacent to the Business College Complex until the fall of 2019. 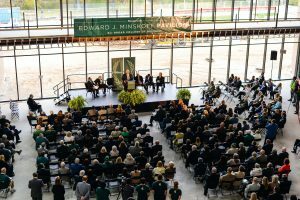 But they can immediately start calling it by its new name: the Edward J. Minskoff Pavilion. The $62 million collaborative learning center received its formal title at a naming ceremony held inside the building’s work site Friday, Oct. 19 honoring Minskoff (BA Economics, ’62), a Manhattan real estate developer, patron of the arts, and philanthropist, who made a $30 million gift toward the newest Eli Broad College of Business facility. Minskoff’s gift was the largest single donation from an individual ever received by MSU in its 163-year history. 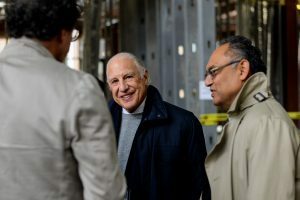 But it was far from the first gift from Minskoff, who has been donating to the university for more than five decades and whose assistance helped open the Eli and Edythe Broad Art Museum. Minskoff is founder and president of Edward J. Minskoff Equities, Inc., and in his career he has developed or acquired roughly 40 million square feet of commercial and residential real estate. He has worked with many of the world’s leading architects and architectural firms, including I.M. Pei, Cesar Pelli, and Skidmore, Owings & Merrill. 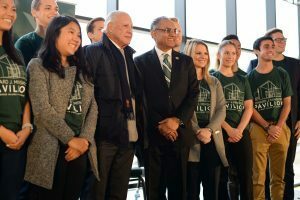 “He’s focused on developing spaces that are ground-breaking and inspirational, so I think it’s really fitting that his name will forever be on this Pavilion here, because I think this is going to inspire many, many students for many decades to come,” said MSU interim President John Engler. 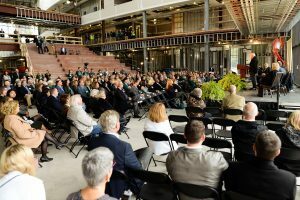 The roughly 100,000 square foot Minskoff Pavilion will include collaborative spaces for both formal and informal activities; technology to empower students for tomorrow’s business; and flexible areas that can change along with the needs of students and the demands of both educators and employers.